If you want to follow along I suggest you first download the Timeline Template which is compatible with Excel 2007 and Excel 2010. 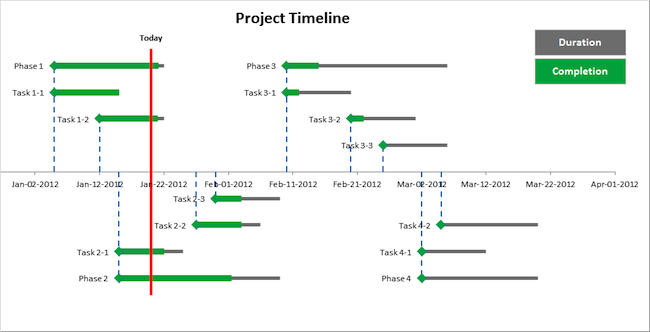 Previously we looked at 10 steps to create the basic Project Timeline chart. If you followed along you would have ended up with gray duration bars, green completion bars and a red today line. The screenshot above shows where we ended up in the previous post at step 10. You can download a copy of the template from this page. Just do something about it already! I know from previous project experience that projects often over-run their original task estimates – it seems to be a fact of life. 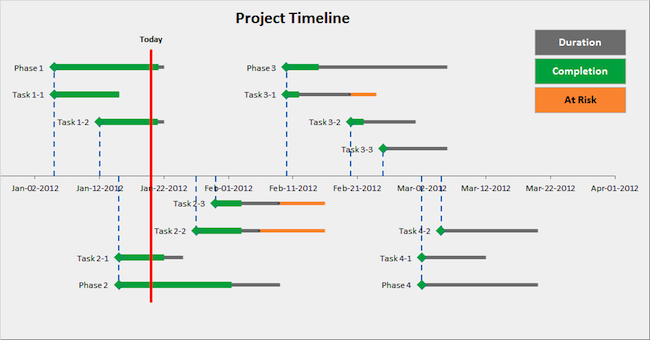 At least you now have a simple way to visualize this in the enhanced Excel timeline! 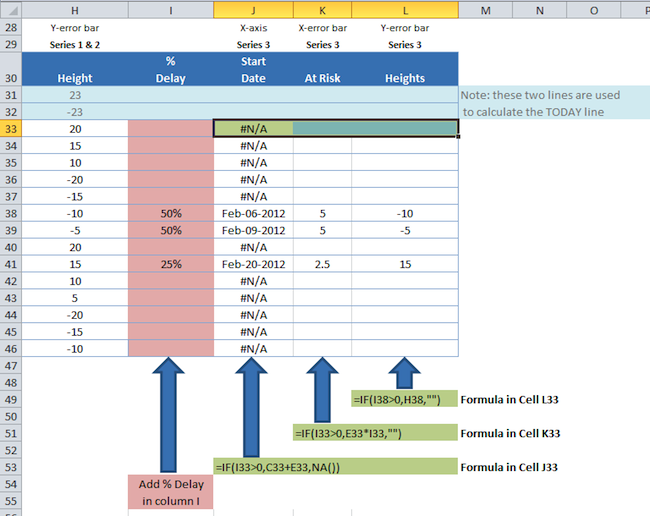 Extend the Timeline Data Table for the new Series "At Risk"
First thing to do is add your “% Delay” for each task or phase that is at risk of delay. In my downloadable spreadsheet column “I” is for % Delay. 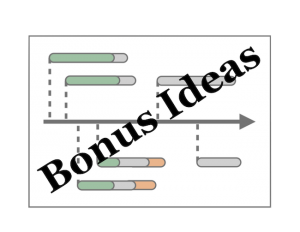 If a task or phase is expected to over-run by 50% then you would put 50% in column “I”. 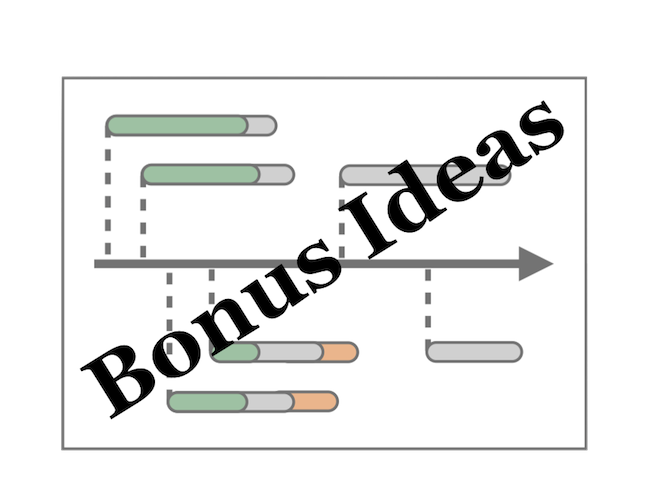 Next add formulas in columns J, K and L. These are conditional formulas so we can choose to show or not show data on the Timeline chart. When Excel creates a chart from a data series it plots all the values given to it even if those values are zero. Now that you have your “At Risk” data, it’s time to add this to the Timeline chart. Back on the Current Selection group, make sure the Series “At Risk” X Error Bars is selected. Excel may bring up the Y Error Bars instead, but we want the X Error Bars for this step. Click on Line Color. Change the line color to Solid Line, and choose an orange color. To show project milestones rather than Phases and Tasks, you can add a new data series where each item has 0 days duration. And you can also format the item marker a different shape and/or color. In my downloadable template I allow Excel to automatically calculate the X-axis min, max and step values. That’s because it’s fiddly to get the dates lined up. If you want to fix the X-axis dates to look more natural you may need to select more meaningful axis scales. I recommend you check out a neat page on Vertex42’s website that was the inspiration for my Timeline Chart template. On that page you’ll see an explanation of how to create a timeline in Excel (written by Jon Wittwer in 2005), and towards the bottom of the page are instructions on how to use a date format in the timeline axis, and also how to use month names in the timeline. If you want to refer to the instructions there, visit this page (note: clicking this link takes you to a 3rd party external website and I am not responsible for any content on that website or any other 3rd party external website). If you remember adding event labels while following my Timeline Chart tutorial at step 4 “The Basic Formatting”, you may remember how difficult and time-consuming this step was. Also if you change the order of events you may need to reorder the labels, which is an inconvenient and time-consuming job. What if you could do this with the click of a button? Perhaps you can write some VBA code to do just that. Or you can check out the Timeline Template created by Jon Wittwer of Vertex42. Jon Wittwer’s Timeline Template contains some VBA code that reads all the event names and updates all the labels automatically. So by clicking on the “Update Labels” button you can update all labels automatically. Jon’s download has two versions of the Timeline Chart – one for historical events that take place over years and the other for shorter projects that take place over months or days. There is a free copy (without VBA) and a $14.95 copy (with VBA) which you need to buy from Jon’s website to examine and use the VBA. There is a brilliant free utility written by Excel MVP Rob Bovey called the “XY Chart Labeler”. Delete Chart Labels – Allows you to quickly delete data labels from a single chart series or all series on a chart. By installing the utility you can do these things for any XY chart in any workbook you use. In fact Rob states that you can use the utility to label any type of Excel chart series that will accept data labels. As of the time of writing, the XY Chart Labeler Utility is in Version 7.1 and is compatible up to 64-bit Excel 2010. Although using the utility involves more clicks than the Vertex42 VBA solution, the XY Chart Labeler is free and can be used in any of your workbooks without transferring any code. You only need to install the utility once. Check out the XY Chart Labeler here. Rob has written instructions on how to use the XY Chart Labeler on his website. If you’re interested in receiving updates about future articles from Launch Excel, take this chance to sign up for my RSS feed. You can also follow me on Twitter by clicking here. And it would be great if you could share this article with your colleagues and friends using the share buttons below. Do you have any other ideas to further enhance the Timeline Template? Use the comments section below and send in your comments. I every time spend my half an hour to read your website. Your style is very unique in comparison to other folks I’ve read stuff from. I appreciate you for posting when you have the opportunity, Guess I will just bookmark this site. Thanks for your comment Nicolas. I’m glad you like Launch Excel, and hope you enjoy our future videos and articles.